5 years 12 weeks ago. 5 years 46 weeks ago. 5 years 49 weeks ago. 6 years 11 weeks ago. 6 years 48 weeks ago. If we had to sum up Simple Machines, the first expression that would come to our mind is that it's a pillar for the world of forum software. This famous product has always indeed guaranteed an high level of quality and has always delivered a complete forum solution. This has to be compared with some of its competitors, that prefer providing an huge list of features, not always well integrated with each others. August 10, 2011: Update review to SMF 2. 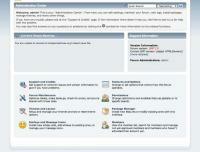 April 3, 2011: Features updates. March 26, 2010-: First Review. 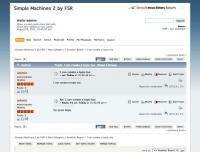 Simple Machines 2 is recommended for Huge Community. Languages supported by Simple Machines 2. Full list available at the SMF Language Packs page. This new version supports the Postgresql and the embedded SQLite database, in addition to the MySQL database, already supported since SMF 1.0. The SQLite solution is perfectly suited for small web servers that do not have any database server installed. Indeed, the SQLite database is only based on a local file, that will be used to store the entire SQL database. Most of smartphones operating systems are supported via the Tapatalk application. Those plugins will be also available with SMF 2.0. More information on SMF Social Modifications page. 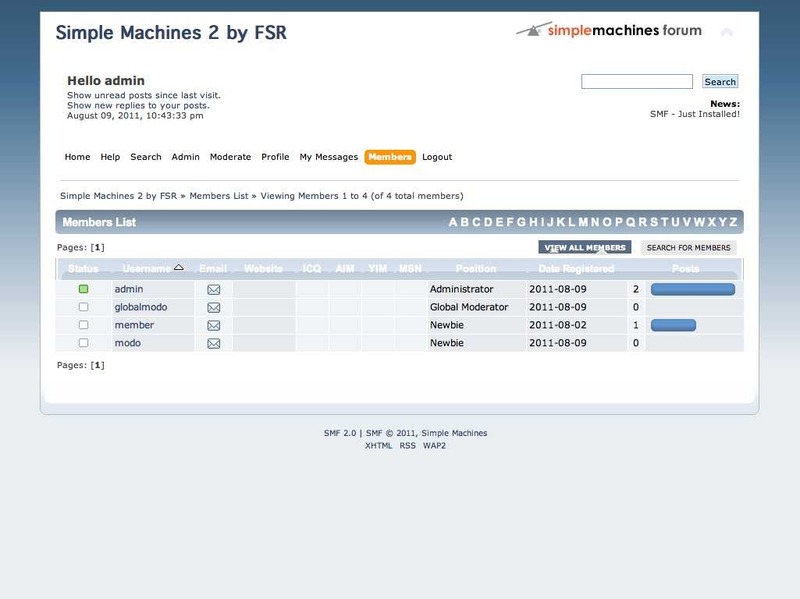 A Tagging System for Topics is also available separately as a SMF Mod. Embedding videos on a post can easily be achieved through a plugin. The Quick reply is quick, of course, but it is also quite powerful, as it embeds the spell checker and you can directly quote a specific message from it. Of course, the Portal Bundled Software is now provided by default, you will have to install a dedicated plugin for this. Some details about Simple Machines 2 features regarding members. Managing members and promoting them are just simple tasks with SMF, and you will quickly get used to this user interface, nice and efficient. Note that it is possible to export the entire content of the database into an XML format, that could be useful if you want to integrate this feed to a third party tool. For more details about the upgrade process, we advice you to read the How The Simple Machines Upgrade Process Works? guide. 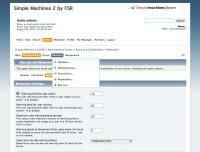 Convert an existing forum to Simple Machines 2. Scripts in charge of migration are called "converters", and are available on the SMF Converters page. Secunia Advisories severity affecting Simple Machines 2. Secunia Advisories impact affecting Simple Machines 2. Facebook Connect can be integrated using a dedicated module: SA Facebook Connect Integration. Those cache systems store the PHP OP Code, and drastically improve performance, as the PHP scripts do not have to be compiled and interpreted each times that a page is read. Does Simple Machines 2 correctly follow (X)HTML and CSS norms? The default theme, called Curve, has been vastly revamped, and is now really more clear, beautiful and powerful. By the way, it is really easy to customize it. Upgrade process is really clean and powerful. Simply overwrite your SMF installation by the last upgrading package, and simply go to <your-website>/upgrade.php page to update your forum. Single Sign One Capabilities, really useful to integrate SMF 2.0 in an enterprise environment, or with an existing CMS solution. Support of Postgresql and SQLite databases. 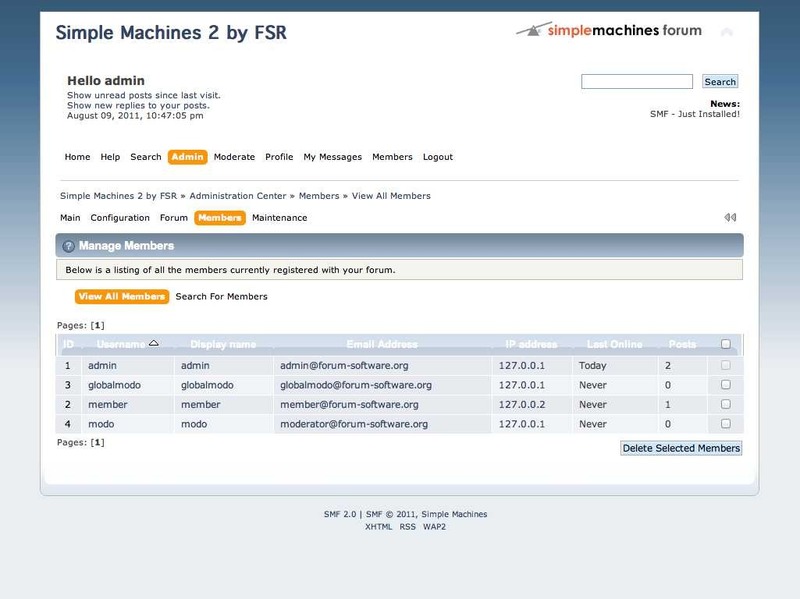 Simple Machines Forum team is one of the rare developers team that releases a version of their product only when everything is done. Everybody knows that SMF 2.0 was developed in more than 5 years, but SMF 2.0 was announced only when the developer team was sure everything was implemented. Direct consequences of such policy is that Simple Machines 2 quality is really impressive and that this software has been polished 2 times more than its main competitors. 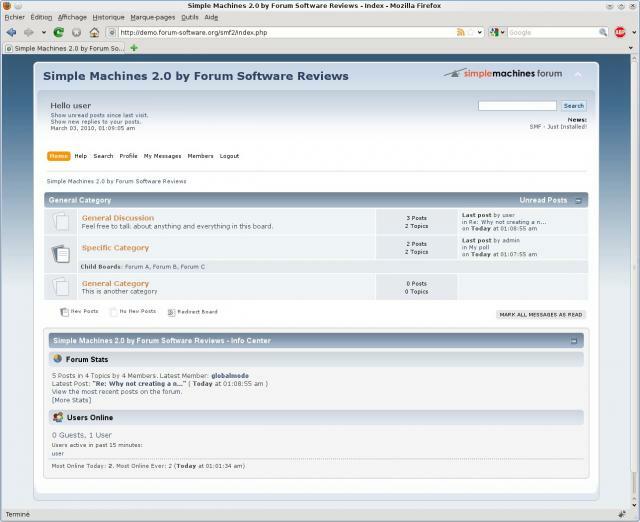 This is the reason why Forum Software Reviews is proud to give the perfect score of 10/10 to the Simple Machines forum software, congratulations! Experiment the Simple Machines 2 Demo. 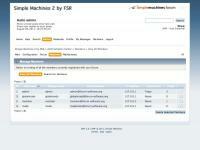 Compare Simple Machines 2 vs PhpBB 3 vs bbPress. 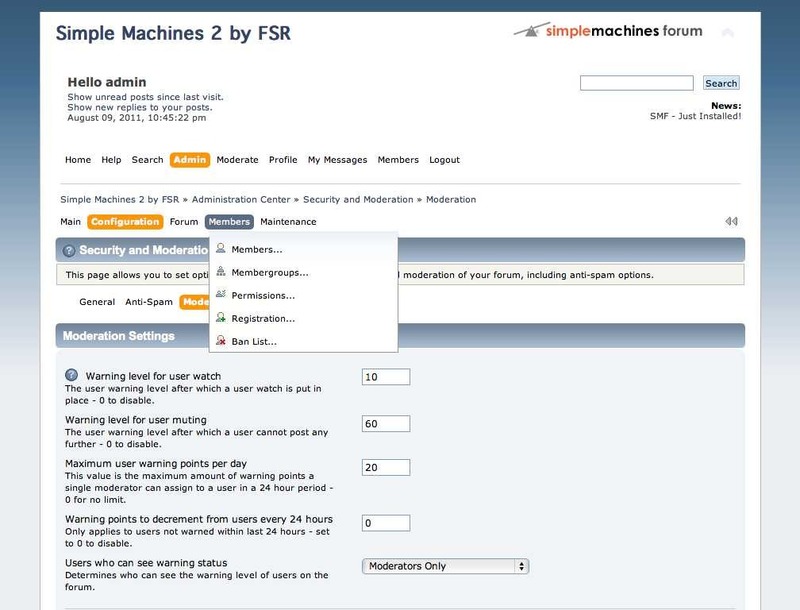 Ask your questions to the Simple Machines 2 Community Forum. 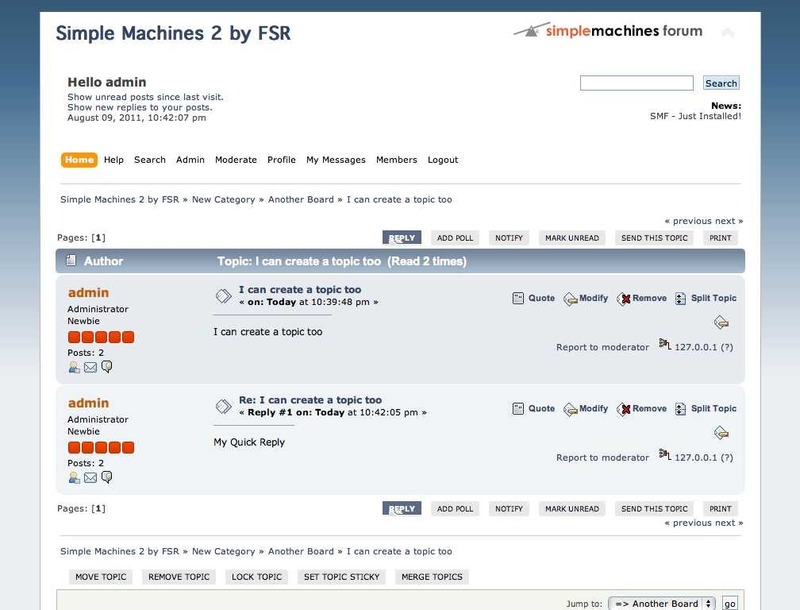 Get Users Reviews about Simple Machines 2 and Share your experience. Yes, but the editor can be improved using additional modules, so, it's something fixable. can smf be implemented into a drupal website like this one? Thanks for the info, this is fixed. I tried SMF. I migrated close to 15,000 posts from phorum. I was besieged by spam posts, that got through the captca form, almost immediately. I fought back by editing IP ranges (West Africa, etc) with their ban list. I went back to phorum. Discussion forums at SMF attempted to blame spam on "paid humans who register for a login,"
on of my own, which appended a symbol to a log file, so I could count login attempts. traffic. I went back to phorum, and redirected login attempts to smf to the fbi.gov site. spam posts appearing on the forum per day. With phorum I have no troube at all. spam posts appearing on the forum per day. With phorum I have no troube at all." Actually I had 2-3 successful spam posts on the SMF forum within the first 12 hours. Just a few hours into the following day (even after fiddling with ban lists) I had a half a dozen. That's when I gave up. Indeed, it has, I actually have no idea why this wasn't ticked. Anyway, thanks for reporting it! 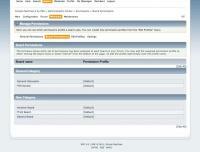 August 10, 2011: Update Hosting Plans according to IPS Post. Are you sure that this is related to SMF ? Definitely not... a failing copy/paste from IP.Board review for the review change history, that I didn't have here before. Thanks for noticing it, this is fixed. MY EYES ON YOU, WATCH YOUR STEPS WORDS. thanks for quick fix, going to test out if they fixed the editor or not. Simple Machines 2.0, that is not yet released (actual version is Release Candidate 3 - meaning that the release is going to happen soon). P.S. - What is this Editor that people are complaining about? Thank you so much! It seems my SMF small description was lost somewhere, and kept this old version. 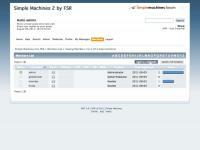 I more or less restored it, you can now correctly read SMF 2.0 is gold since 2 months now. Forum Migration section has been updated as well with the official SMF converter list (thanks too). Regarding the Editor, I don't know which one @SAFAD is talking about. Do you have more details? Thanks for the info, I am trying to decide on which forum I should go with...I am leaning towards simple machines 2 because of the facebook connect and blog bridges. This is typically a good reason for choosing SMF, which supports these two features particularly well. BUT . . . has there been any resolution to the spamming issue? And can anyone answer that question as to how the spammers' bots discover a new forum so quickly? SMF is really good for beginners, its easy to use and I think it loads quite fast. The only problem is that a big part of the plugins don`t work with the new version. I'm looking for a good forum software to support 100K+ users, and this seems like the best bet, but I'm hesitating because 771 user reviews have it sitting at 3.7/10 stars. However, other than the one person posting about getting spammed, and a few people saying it's ugly, I haven't seen any reason for the terrible reviews (and in fact, everything else has been positive). Anyone have insights? Hope it helps you making your choice. If not, you can also count on phpBB to do the job really properly. Been browsing this site for the last couple of hours as i'm planning to create a forum. My choices are, obviously, SMF, myBB and phpBB. But i still have some (TBH, a lot!) doubts. First off, i feel SMF has everything i need but i would like to troll something: Y SMF HAZ NO GUD LOOKS! I love phpBB looks and its layouts but i've come across many phpBB forums getting hacked/defaced. :/ Not to forget spams love phpBB forums (or am i wrong?). Security is important and i feel that phpBB lacks something here. Having said that i love the layouts of phpBB. Going back to SMF it does have a very good support community. Has the issue reported by one Pittendrigh fixed? 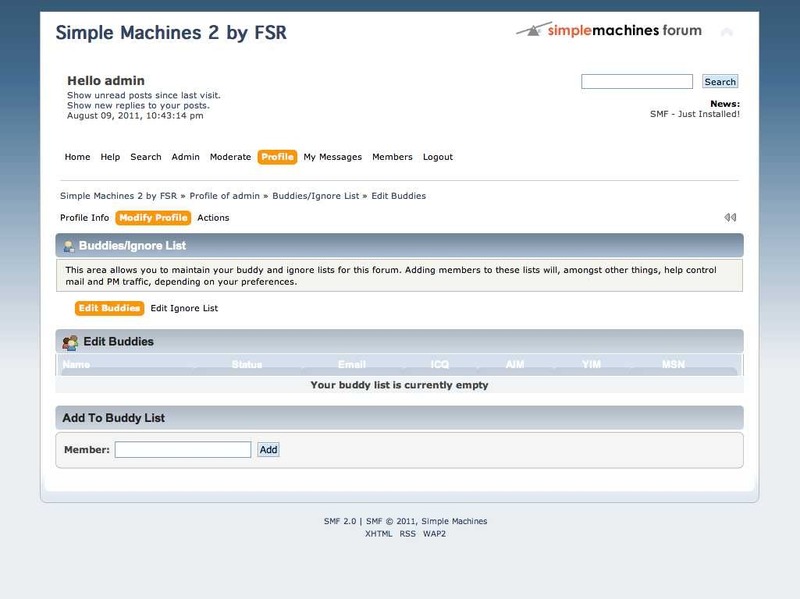 Also, is it possible to make SMF look like a phpBB forum? Is there any nice theme? 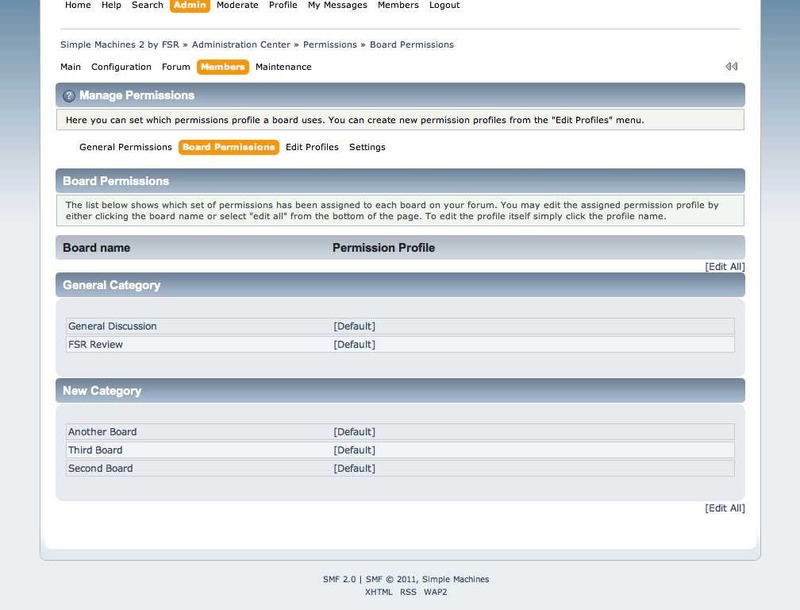 Like i mentioned before, i like phpBB looks and page layouts but i'd like to have the functions of SMF. Is there any solution? If there is no theme/mod to make SMF be user friendly or look 'pleasing to the eyes' like phpBB then i'll have to avoid SMF which i don't want to. About myBB, i've read your reviews and a friend of mine is using it but i'm still not sure if its that reliable. I can convert the forum software if i wish to but that would too much of a hassle. So once again, for me its phpBB vs myBB vs SMF. I only hope that SMF community will do something to make the forum more attractive and neat. And as for me i haven't decided what to use. hello, there are many themes and mods available for smf . you can see the designers' adverts on the site itself. can any one answer about the spam issue with smf? I already try " MyBB an phpBB3 YaBB " . and always have issue with . But SMF like it name Simple install Simple visitor registrant Simple Mods Install in few seconds Fast search response Page loading . SMF is the worst BB after PHPBB! smf is the best FREE software. and I so happy its best forum for linux hosting but, for windows...not good. 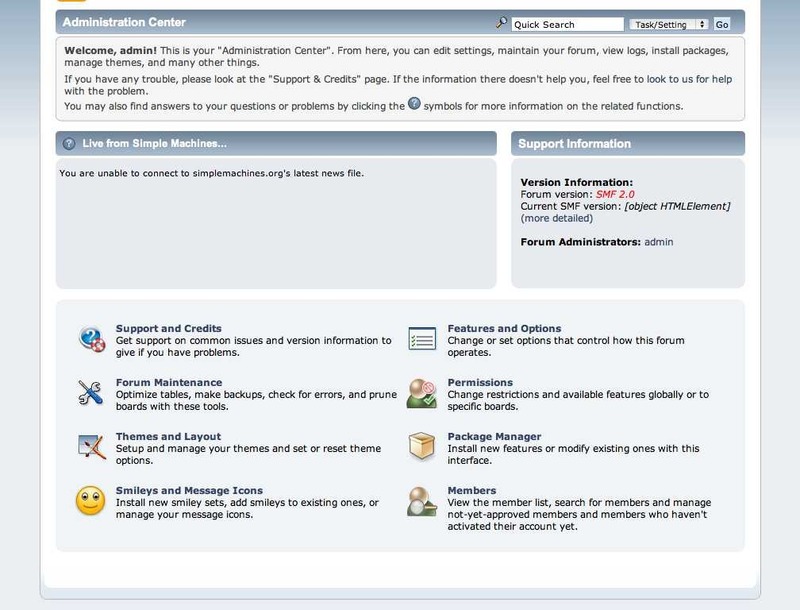 If you have windows hosting don't install smf forum, that is my honest opinion. I'm about to install SMF on my site. Pretty amazing software! Easy to customize and comes loaded with many useful plugins. I am going to install it on my sub domain and let see how it goes. SMF is ideal for beginners, easy to use and I think it recharges quickly. The only problem is that most plugins do not work with the new version. There's no restore database option in SMF. If you are paying for Xenforo or VB you are paying to much. it was cool, but subjected to hacks, and security issues it was down right scary. 2.0+ seems to have continued to get better and better. SMF vs Xenforo and VB's paid software. There is just no comparison at all. I do not want to be out 200+. So grin and bare it with XF. the top modification. And over modded themes they often will require code modification to do this. Xenfor and VB have easy upgrades but over complicates everything. SMF keeps it simple and intuitive. I think SMF stand up to being the best, and at free it just does not get any better. SMF and to keep up you must pay pay pay . SMF is Free free free.